The PowerTouch line of electric shavers from Philips was always popular due to the low price and surprisingly good shaving performance. In this review we take an in-depth look at the Philips Norelco Shaver 4100 (AT810/41) from the Series 4000, a razor that just might be one of the best budget rotary shavers you can get. Read along for the full test and find out how it performed. Wrapup—Who should buy the 4100? A few months ago we reviewed the Norelco 3500 and it delivered a solid performance, but with two pretty big shortcomings: charging it took a whopping 8 hours and it couldn’t be used for wet shaving in the shower. 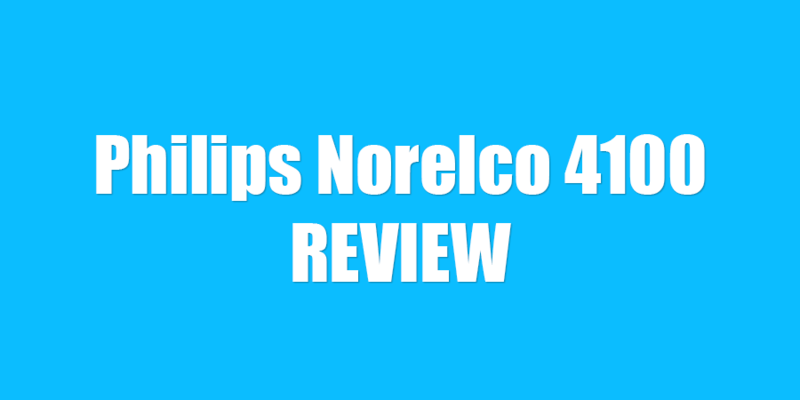 The Philips Norelco Shaver 4100 addresses those exact issues and it does that for just a marginal price difference. As mentioned previously, the 4100 and 3500 are basically identical, with the difference that the former is fully waterproof and can be used with shaving gels and creams and the charging time is greatly improved. LED indicator for battery full, battery low and charging. The 4100 feels very light and comfortable to hold and even though the materials don’t look that posh, it is well built. The color scheme is also more attractive than the one on the Norelco 3500 with a combination of aqua blue, silver, and black. The front of the razor features the LED and the ON/OFF switch, which is covered in a rubberized material that extends to the sides. This ensures a very secure grip, even when it’s wet. The back of the razor is just a plain, matte black plastic with nothing but the popup trimmer. The very basic battery indicator is my main gripe with the ergonomics of the Philips 4100. Other shavers that are priced similarly often come with a 2 or even 3 level battery indicator, which is a lot more useful than just a low battery LED. The Norelco 4100 comes with a Li-ion battery that takes about one hour to fully charge and will provide enough power for 50 minutes of use. There is also a 3-minute quick charge option that will come very handy since you can’t use the shaver while it is plugged in. This is a safety feature that is present in all shavers that can be used in the shower. Also, being a Li-Ion battery means that you can charge it whenever you like without the fear of affecting it in any way. Cleaning the shaver is very simple: you just pop the shaving head open and rinse it under running tap water. You can also choose to use the brush that comes in the package, but cleaning with water is a lot more effective. This quick clean takes little time and it’s very easy to do. However, every once in a while it’s a good idea to clean each of the three shaving heads to remove any hairs and grimes lodged inside the combs. This implies taking the shaving unit apart and cleaning each cutter and comb, making sure not to mix them up as they are matching pairs. The Norelco 4100 will provide a decent shave that will satisfy most men. The closeness and comfort of the shave are very good for a rotary shaver in this price category. The rounded shaving elements glide smoothly on the skin, regardless if you shave wet or dry. It does an especially good job when it is used for daily shaving, however it will perform decently even on longer hairs (around 3 days of growth), but don’t expect anything extraordinary. Another pro is the ability to use it for wet shaving. While the dry operation performance was good, it can be further enhanced by using a shaving gel or cream. As it’s the case with the very similar 3500, the motor is not as powerful as on more expensive Philips Norelco shavers and as a result your shaving may take a little longer. Where it might struggle a little is with long or very tough beards. If you shave every 2 to 3 days or more you may experience some difficulties in getting a very close shave. In this case, you may want to spend some extra money on a more expensive and powerful rotary shaver. All the razors from the PowerTouch line use the same replacement part: Philips Norelco HQ8 cutter heads. A newer and supposedly improved version of these cutters is now available, the Sh50/52. The part should last for at least one year before needing to be replaced. Of course, this will vary; depending on your shaving routine and facial hair, you may need to change it sooner or later. 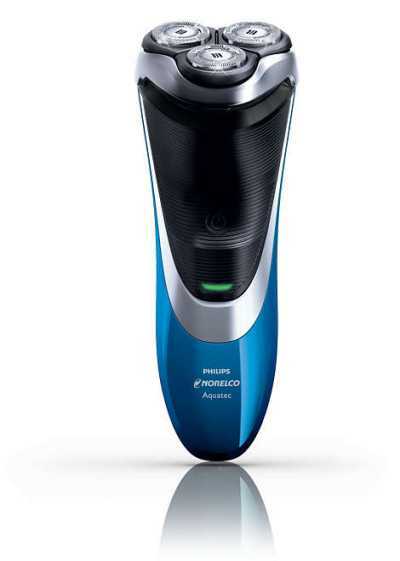 All in all, the Philips Norelco 4100 is a solid, effective and a decent shaver for this price range. As mentioned in the performance section of our review, most men will be satisfied by the closeness of the shave, especially when it is used for shaving more often. As a bonus, you can also use it with a shaving gel in the shower. With that in mind, it is a solid option for anyone looking for a quiet, robust, rotary shaver that doesn’t have a prohibitive price and will get the job done. Also, if you shave your head and are looking for an inexpensive rotating shaver, look no further. Of course it doesn’t have the bells and whistles of the more expensive Norelco shavers and that’s not necessarily a bad thing. There will be fewer things to break down and it will be very “cheap to run”. If this is your first electric shaver, the fact that it is a simple, easy to maintain, waterproof shaver makes it an excellent option. The Philips Norelco 3500 (PT730) is an identical shaver that costs slightly less money, but you can’t use it for wet shaving and it takes 8 hours to fully charge. You do have the option to use it while it is plugged in though. So if you don’t care about these shortcomings, you can go for it as the (dry) shaving performance is identical. If rotary shavers aren’t your thing, you have an excellent alternative for pretty much the same price: Panasonic ES8103S. It is also a fantastic budget shaver that will likely provide a closer shave for most users. Do keep in mind that foil electric shavers are noisier than the rotating ones. Either way, you can’t go wrong with any of these. Feel free to ask any questions in the comments section below.